This semi-regular column features the summer learning adventures of our majors. Senior Erin Hein restores a frame during her internship at the RISD Museum Conservation Department. Erin Hein, a senior double major in art history and chemistry, spent two and a half months as an Andrew W. Mellon Summer Intern in the Rhode Island School of Design (RISD) Museum’s Conservation Department this summer. Hein is one of our top scholarship recipients, an art ambassador and, along with her double major, has a minor in the Blount Undergraduate Initiative. 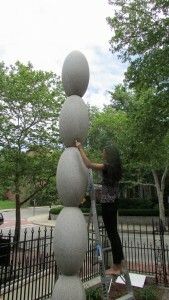 She plans to graduate in the spring and has been considering further studies in art conservation. This internship helped her learn more about what a career in conservation might be like. As part of her work at the RISD Museum, Hein restored a frame for an artwork scheduled to go out on loan. Through this work, she acquired new skills such as plaster molding and gilding and she developed an appreciation for the artistry and craftsmanship that go into frame making and framing art. And, Hein learned more about herself in the process. EH: I learned how to think critically about the care of objects in the collection. We spent time discussing preventative care, such as the storage of different materials. I was also able to use my chemistry background and synthesize my knowledge of polymers with my art history background to do a survey of the plastics in the collection. We were looking at the level of degradation in the plastics and decided on the needs for each piece. 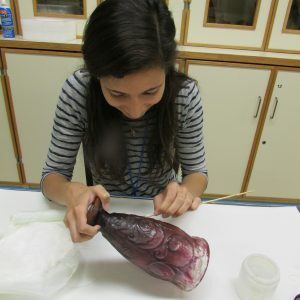 I was able to condition report several objects and research the best course of treatment for those objects based on the materials they were made out of, their function within the collection and the courses of treatment available to us. What skills did you learn? Any unusual ones? EH: As for unusual skills, I would definitely say that gilding is one of them. I also learned how to repair frame liners by stitching together fibers of the liner. 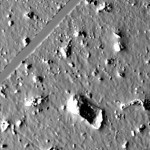 I was also trained on and utilized a Scanning Electron Microscope (SEM) to look at the surfaces of degrading plastics and identify the type of plastic used. LEFT: A deaccessioned art work magnified under a Scanning Electron Microscope (SEM). Looking at the surface of degrading plastic allowed Hein to identify the type of plastic used and decide on the best course of restorative treatment for the piece. RIGHT: During her internship, Hein repaired a frame liner by delicately stitching together its fibers. Has the experience made you want to go into conservation? EH: While I loved working in the Conservation Department this summer and was planning on going to conservation school as a result…Once the summer was over, I realized that the part of my internship that I loved the most was the research of objects that I was working with and building a story around those objects. Because of this I am going to apply to graduate programs in Art History. 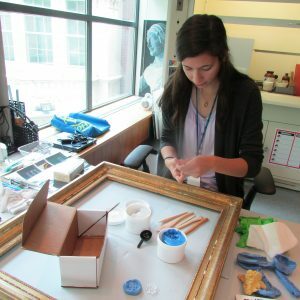 At the end of her internship, Hein wrote a blog piece about her experience with the restoration process, which the RISD Museum published recently on its website. 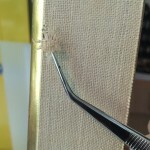 In the blog, she described in detail how she restored the frame and what she learned about the role of framing art as a result. If you are a returning studio art or art history major and you had an interesting summer learning adventure, contact Rachel Dobson at (205) 348-1893 or rachel.dobson@ua.edu to tell your story!